Your goal is to obtain the Ultimate Boulderdash Bike by outpointing your opponents in an eight race competition. There's six riders to choose from (each with their own stats), as well as Easy, Medium, Hard and RockHard difficulty settings. Nitro can be used to speed ahead, and similar to Road Rash (1991, Mega Drive) you can punch fellow drivers to slow them down. The first thing of note is the fantastic animated intro that resembles Wacky Racers with its cartoon based violence and utter carnage between opponents! Things don't fare as well once the action begins though, due to the limited draw distance that makes it tough to see upcoming turns. Also, the frame-rate is low which can result in over / under-steer. However, it controls much better than the terrible Sega 32X port making it more playable, and crashing into the scenery is a less frequent experience. 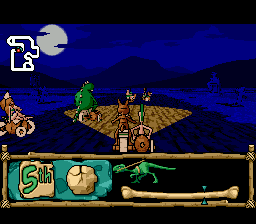 Another advantage over the 32X version is the ability to attack riders on both sides, rather than exclusively to the right; this obviously makes a huge difference from a strategic angle and stops you from taking unfair damage. With less rage-inducing gameplay problems to deal with, the track design is allowed to shine on a grander scale; granted, the courses aren't anywhere close to the quality of Super Mario Kart (1992, SNES), but there are some neat ideas here such as the Night Rally track where your bike lights help to guide you through the terrain. Unfortunately, load times are lengthy throughout (approx. 30 secs between races). Also, the characters don't show any personality and there's only minimal fanfare when you complete a Grand Prix. BC Racers on the Mega CD is a significant improvement when compared to the version released on the more powerful Sega 32X thanks to its superior combat mechanics and tighter controls. It's still not perfect by any stretch of the imagination, but if you're looking for a decent combat-racing game it might be worth giving this one a try. Random trivia: In 1995, the game was also ported to the PC and Panasonic 3DO.